The David Tennant Treat 4 Today is the comic sketch which was screened on the John Barrowman programme Tonight's The Night on BBC One. The show had run a competition to design a Doctor Who monster and the winner had the chance to perform on the TARDIS set. 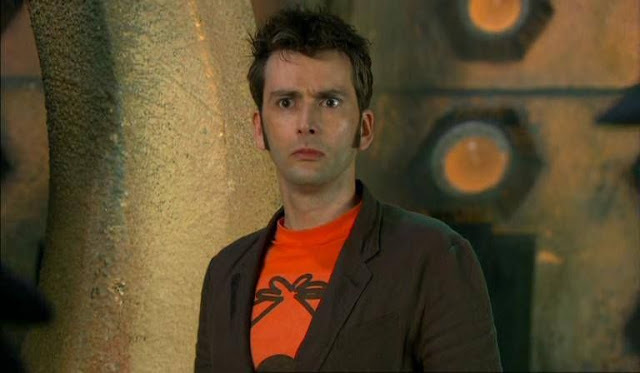 To his delight David Tennant played in the skit too but not as the Tenth Doctor. Russell T Davies said later that he couldn't bear the final words he wrote for the Tenth Doctor to be against a man wearing a blue sock on his face! If you keep watching after the sketch has ended, it shows the moment that David approaches the winner! Apologies if the video does not play in your country.